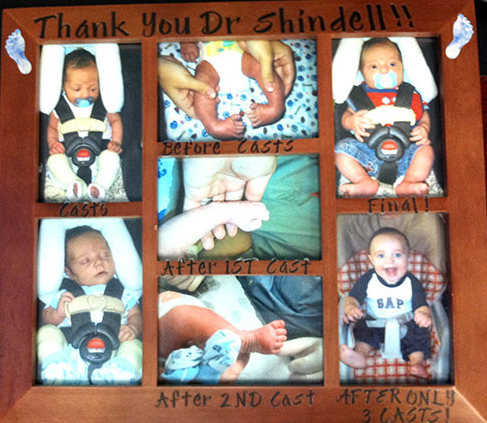 Pediatric Orthopaedic Medical Doctor in Phoenix, Arizona | Dr. Richard Shindell M.D. The treatment of Club Foot or Talipes Equinovarus has changed markedly in the past several years with the use of the Ponseti technique. What used to require a major surgery at about 7 months of age now is generally treated with a series of 3 to 5 weekly casts and perhaps a minor release of the achilles tendon. Special shoes with a bar between are used until age 4 or so to prevent recurrences, and the success is seen in a flexible, pain free foot. Certainly success is not universal, but I rarely have to operate on all but the most resistant foot. This technique does require strong cooperation from the parents, who may hold the key to the child’s future in these cases. Many children are born with findings about the hip- some are benign sounds such as clicks, while others have “clunks”, which can suggest dislocatability. “Clicks” can usually be explained by benign interactions such as tendons popping over prominences, and do not need treatment. “Clunks”, or dislocations, on the other hand, most often can be treated with simple measures such as the Pavlik harness, holding the leg flexed and drawn slightly outward. Even this may be overtreatment, as many hips will become stable without treatment. The hard part is deciding which ones to treat, and the Harness has good success with few complications. Most hips are stable until the last part of pregnancy/ delivery. We have theories about what causes the instability, including position in the birth canal (a high predominance of Left hips), maternal hormones (girls exceed boys), and uterine compliance (high number of first born). Family history is important as well. The majority of hips found early respond to Harness treatment. Those hips which are stiff and dislocated during development are resistant- very often associated with other conditions. There are hips which present late, often seen as a waddling gait in a toddler.There is some evidence that some of these may have been normal at birth, but controversy exists, especially when it is your own child. In those patients who present late or are resistant to Harness treatment, surgery may be the best option. This may be as simple as a “closed reduction” under anesthesia- essentially maneuvering the hip into the socket- or an “open reduction”- where there is an incision into the hip envelope, and sewing of the envelope to give stability. Even once the hip is in place, we need to follow closely until maturity as the hip and socket need to grow normally with full “coverage” to avoid arthritis. If a child presents very late, such as over 4 to 6 years old, sometimes the natural history of remaining dislocated is better than what we can provide with surgery.